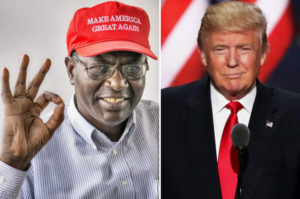 The “deep disappointment” in his half-brother’s presidency and Hillary Clinton’s performance as secretary of state has driven Malik Obama to the GOP and Donald Trump. “I like Donald Trump because he speaks from the heart,” Obama, half-brother of President Barack Obama and a longtime Democrat, told The New York Post from his home in the rural village of Kogelo, Kenya. Obama, who lived and worked for many years in Maryland, is registered to vote there, public records show. The president’s 58-year-old half-brother said the last straw came when FBI Director James Comey recommended not prosecuting Clinton over her haphazard handling of classified information while secretary of state. “She should have known better as the custodian of classified information,” said Malik Obama. He was also angered over Clinton and Obama’s role in the intervention in Libya that led to the death of Col. Moammar Gadhafi, whom he called one of his best friends. The president’s and Malik’s father, Barack Obama Sr., left Kenya in 1959 when Malik was a year old and his mother was pregnant with his sister Auma. Obama Sr. enrolled at the University of Hawaii, where he met and married the president’s mother, Stanley Ann Dunham. Malik Obama didn’t meet his younger half-brother until 1985. President Obama, 54, has seven half-siblings from both sides of his family.